There's several tricks to making good fried rice. First, you really need to start from cold rice. For me, if I plan to make fried rice for dinner tomorrow, I cook the rice while fixing dinner tonight so it will be thoroughly chilled. The other trick is that the rice must not be sticky. You can use sticky rice in lots of recipes, bu it doesn't fry well. The tricks to making it fluffy instead of sticky include rinsing the loose starch off the rice, soaking it if it's old, using less water than usual and letting the rice rest. Rinse the rice in a colander until the water runs clear to get rid of loose starch (Optional: if it is old rice, soak it for a half hour.) Drain well. In a medium saucepan, bring water and salt to a boil. Add rice, lower heat to a simmer, cover and let cook for 12-15 minutes, until the water is absorbed. Removed from heat and let sit covered for 5-30 minutes. Fluff with a fork; transfer to a storage container and refrigerate until thoroughly cold. 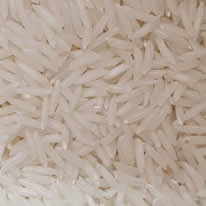 Add 1 TB melted coconut oil to cold rice and mix to separate the grains. Heat 2 TB coconut oil in wok until it just barely smokes. Add bok choy ribs and stir-fry until they start to brown. Add bok choy greens and scallion whites and stir-fry until greens have wilted. Add garlic and ginger and stir-fry until fragrant. Add rice and tamari and stir-fry until mixed and heated through. Stir in eggs and cook until just set. Remove from heat and top with scallion greens. Image credit: Adapted from "JasmineRice". Licensed under CC BY-SA 2.5 via Wikimedia Common.